In the simplest terms, sourcing entails “buying a product”. So presumably, if you have the need for a product and know the cost at which you want to buy it, and you can find someone who can sell it to you, it should be a straightforward transaction. What happens in reality is often somewhat different. You start with a product in mind, with certain specifications. You build certain sales projections based on past performance, forecasts etc., you evaluate supply bases, select one or more suppliers, factor in a logistical plan to get the product from your supplier to your distribution centre or stores, manage the communications, often including information technology to control the 2-way flow of information, and finally hope to achieve the margins that you had planned for. That may well happen, but equally there is all possibility that it might not. On the supplier’s end, equally, the customer’s sales forecasts might not be achieved which might lead to reduced order quantities, the logistics provider might delay or even lose your entire shipment, causing claims, or even loss of a customer.So is a sourcing relationship a gamble? Tesco approaching the customer through supermarkets, neighbourhood stores, convenience stores, hypermarkets, the internet and catalogues, and also growing its business through acquisitions in western and central Europe and south-east Asia. Each trend places a different set of demands on the sourcing and supply strategies and structures. For example, cross-border moves create the need for multiple supply bases, due to differential production costs as well as import regulations, and also highlight the need to manage increasing logistical complexity. If a supplier is to keep pace with its major customers, it must be able to service them in multiple locations equally well. Consolidation through mergers and acquisitions creates the opportunities for economies of scale, brings out the need for large, well-equipped suppliers, but also provides the opportunity for supplier rationalisation, which can be a threat to the business of suppliers who may not appear among the list of the “best” suppliers for the newly merged retail business. Format migration creates different service needs for the same retail customer; for example, a high street retailer who normally has only marginal merchandise returns might face the need to handle as much as 15-30% returns on a new catalogue or internet business. Different formats, or different markets can also require product diversification due to different sizes, or different price-quality norms. On the other hand, on the trade side, there have been significant shifts in terms of trade agreements such as transitioning of the GATT to WTO, which promises lower import barriers (quotas, duties) and regional agreements such as NAFTA, which are collectively leading to encouraging trade across borders. There is an increasing availability of new low cost supply bases in close proximity to the major markets (such as Mexico for North America, and Central Europe and North Africa for Western Europe) where export growth is booming, creating serious competition for the well-established trade routes such as Asia to North America and Western Europe, or intra-EU trade. The trend towards cross-border trade is clearly visible, particularly in the US and EU, where imports have gained market share from domestic production. In the EU’s case domestic production, while still higher than imports in terms of share, has actually declined since 1990. USA sourcing shifts point towards a clearly dominant share of sourcing from within the Americas, and indicate a growth of a “Free Trade Area of the Americas” (FTAA) from the NAFTA concept. This would clearly serve the domestic industry’s competitive purposes as well, since production elsewhere in the Americas could be either owned or closely controlled by US manufacturers. The EU, on the other hand, seems to be diversifying its supply base. While Eastern Europe and North Africa have come up quickly in the recent years, Asia maintains and is growing a dominant share, with many other bases expanding or appearing, such as the Indian subcontinent and new supply countries in South East Asia. So what should be your response in terms of future business strategy? First of all some fundamental shifts must be made in thinking about sourcing and supply. 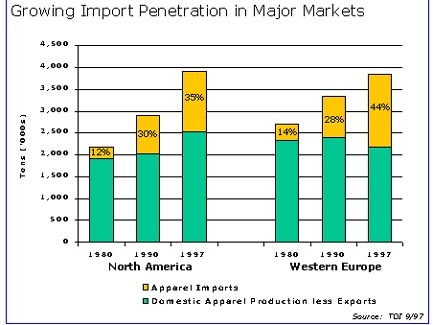 Sourcing strategy needs to be driven by market fashion and consumer proposition. Different, appropriate sourcing methods can co-exist in the same business. “Best practice” depends on consumer and product life cycle needs of each business. A study done by the global consulting firm, Kurt Salmon Associates, calculated that for every new country that you move into, a trial order of 10,000 pieces would cost an additional US$ 42,500 in terms of supplier identification, development, product development, quality assurance etc. – that is over $4 a piece. Is every new opportunity worth that cost? Will you be able to gain adequate margins over significant volumes that will make the initial investment pay for itself? Will the new supply country be able to offer an extensive enough production base that go beyond the first products that you have looked at? And even, could the country actually become a market for you in the future (in which case it makes eminent sense to develop it as a supply base)? To be most effective in the emerging scenario, look for sourcing platforms or “hubs”: countries and supply bases that not only are strong suppliers right now, but those that can serve as launch-pads to enter other countries. These platforms or hubs are typified by being located amidst many other potential supply bases, they possess intrinsic skills to develop product and manage production, and have access to a variety of raw material, both local and imported. Rather than making the buyer hop countries every time there is a problem or a new opportunity due to lower cost, the hubs allows the buyer to concentrate efforts in a region, develop that supply base consistently over a number of seasons or years, while leaving the low cost or new product opportunities open in other countries in the proximity. Understand costs completely: these include not only the primary product cost, freight and import duties, but also financial costs (e.g. Letters of Credit, financial administration etc. ), cost of quality assurance, remote business management costs etc. Further, the drivers need to go beyond primary cost, market access and quotas, and must take into account measures such as “realised margins”, responsiveness and match with customer proposition. Low labour cost supply bases exist even close to the major markets now – so is Bucharest better or Bangalore? The answer lies in looking beyond costs alone. What capabilities do you possess within your organisation, and what do you want from your supply base? The more product development, supply management and service capability you can build within your own organisation, the greater the number of potential supply bases. Typically, with a highly developed sourcing organisation you would be able to tap into more low labour cost supply bases. Three key areas define business focus: Price, Product and Service. Each demands a different approach to the customer, and therefore to sourcing and supply. A price-orientation focusses on efficiency, a product-orientation on innovation and product development, while a service-orientation focusses on reliability and responsiveness. You need to determine what combination of these factors determines your positioning in the competitive marketplace. Also understand that traditional sourcing, based on seasonal patterns and long, variable lead-times are giving way to new methods. Companies increasingly need to classify their products as core products, seasonal products and fashion products. Core products tend to be basic staple items that provide large amounts of business over long periods of time – the focus in these clearly needs to be on planning, replenishment and efficient, cost-effective, consistent supply. Fashion products on the other hand have a very short selling window, and must be developed and brought to the market quickly – their value is in their newness and their being in the market at the right time – the focus here clearly must be on speed in product development and production. Research indicates that major companies are indicating a shift in their sourcing from traditional seasonal patterns to replenishment-type of sourcing and “speed” sourcing. Have you analysed your own product range and adapted your sourcing accordingly? If you are a supplier you also need to understand these issues, and must adapt your business strategy suitably. Or else you run the risk of losing your business to a lower cost or more responsive competitor, who might either be next door, or half-way across the globe. Defining your competencies in the supply chain. To do so, it is imperative to put in place all the building blocks: appropriate management structures, business performance measures, business processes, training and skill development, information technology and supply chain relationships. Ignoring any of these building blocks will only result in a shaky foundation for future business.